Older people are often desperate to stay in their own homes, to avoid going into retirement and care homes and to retain their independence. However, ‘aging in place’ – enabling someone to remain in their own home – often requires considerable additional arrangements. However, the world of technology has delivered a range of inspired and practical gadgets that can assist us when caring for elderly friends and relatives and help us to meet their growing medical and emotional needs. Statistics predict by the time we turn eighty, one in five in the developed world will have dementia, one in four will have lost their eyesight and four out of five will have hearing difficulties. Luckily, there is an increasing wealth of gadgetry specifically designed for older people and adapted to be user-friendly for those with failing sight, reduced dexterity, memory and mobility and hearing loss. The power of tech can be harnessed for those of advancing years to make their homes substantially safer, to support and monitor their day-to-day activities and enable longer independent living. Tech can also can assist those caring for elderly friends and relatives and help us to meet their growing medical and emotional needs. Research shows contrary to popular opinion, older people are increasingly confident at adopting technology and using it to help them remain safe and healthy at home. In fact, according to a recent study by the Office for National Statistics, 44% of adults aged 75 years and over were regular internet users; with internet use among women aged 65-75 showing the highest increase, rising from 47% in 2011 to 79% in 2018. Additionally, in the 65-74 age group, internet use has increased from 52% in 2011 to 80% in 2018, suggests older people are increasingly turning to the power of tech. And with many adaptations such as enlarged screens and supersize buttons on keyboards and remote controls, there’s no reason why those with failing eyesight shouldn’t continue using technology. Around one million older people regularly receive care in their homes, and this is often their only contact with anyone. Many older people frequently go for more than a month without any contact with friends, family or neighbours. This makes them extremely vulnerable to fraud, scams and hoaxes and they are often targeted by criminals for just this reason. Feeling connected to our communities is vital to health and wellbeing – it has been suggested that feeling isolated and lonely can be as damaging to our health as smoking 15 cigarettes a day. Loneliness is a problem technology can help alleviate. Most of the UK keeps connected and in contact with friends and family using social media. This is no different for older people. According to a recent report (the communications regulator’s Audits’ Media Use and Attitudes report) 27% of people over 75 now use tablets, and 41% over 75 have a social media account. Technology in the form of Skype and FaceTime help older people maintain contact over long distances with friends and family. Gadgets such as Amazon’s Echo Show allow them to make video calls more easily. For older people just being able to ask Alexa what the weather is, or for a funny joke, can foster a sense of computer companionship. From ordering an online weekly shopping delivery or online medication, to having an appointment with a virtual doctor, to receiving online counselling, these services demonstrate mobility is not a requisite for receiving support. Technology is also there to make sure our older people enjoy safe connections. 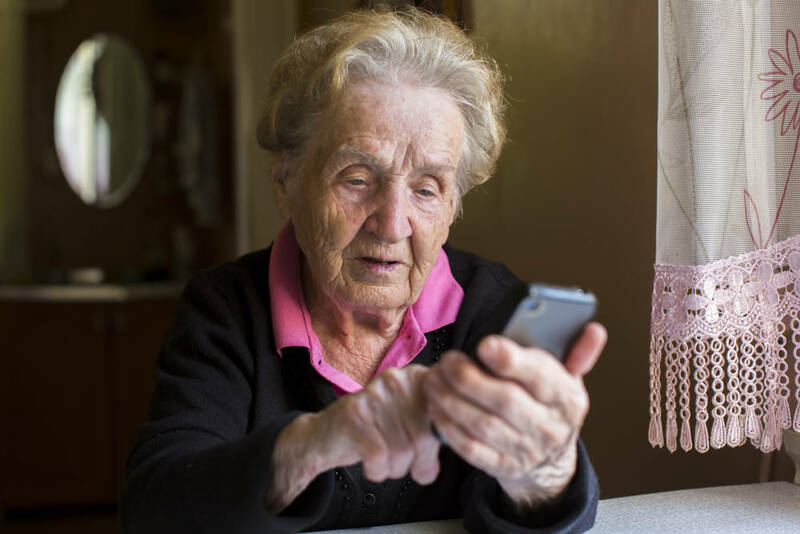 For example, older people are particularly vulnerable to scams, but call screeners block unwanted callers, allowing only trusted callers through. Not sure about someone? A personalised message invites them to call a close family member to verify they are genuine. The telephone guest list can also be managed remotely. Electronic dispensers emit an alarm to remind older people to take their tablets and only stop once they’ve taken them. These dispensers can also send an alert to carers’ phones if the medication has not been taken at the prescribed time, or according to the prescribed dosage. Telehealth supports people with long-term health conditions to stay independent whilst receiving support to manage their health, aiming to manage and diffuse issues that might otherwise result in being taken into hospital This makes it ideal for those suffering from long term health problems such as heart conditions, hypertension, epilepsy, chronic asthma, diabetes or lung problems. The individual is taught to use equipment to monitor their own heart rate, blood pressure, blood sugar levels or body weight. The devices are connected – via the phone line – to a computerised database in which the readings are analysed by a healthcare professional who can recommend medical intervention if necessary. And since any changes in the person’s condition are also constantly noted, it is possible to initiate earlier intervention. The Apple Watch Series Four features an electrical heart rate sensor that can take an electrocardiogram and instructs you if your heart rate is above or below its normal range. Apps such as Dexcom allow for a continuous glucose monitoring system on your compatible smart device, allowing people to monitor their Diabetes at the touch of a screen. The most basic wearable personal alarms emit a loud noise alerting those close by that the wearer needs help. More advanced alarms can send for immediate assistance. They can be linked to a carer or a 24-hour monitoring service. These small devices can be worn around the neck or attached to a mobile phone case. Waterproof versions can be worn in the shower – an accident hotpot – and the alarm’s range should be set to cover areas commonly visited, such as the garden. The buddi is a fitness-style wristband to be worn 24 hours a day, including in the shower. It features alert buttons, a falls sensor and can connect you with selected people through your smart phone. If you press the alert button – or if the system is alerted you’ve had a fall – your chosen contacts are contacted instantly. Additional features allow you to cancel the alert if you decide it isn’t necessary after all – which isn’t uncommon in the panic and shock after a fall or accident. There is a link to a round-the-clock professional support service if your loved ones are on holiday, and if you are not a smart phone user, there is a smart ‘clip’ that stands in for the phone. A further feature allows you to designate safe zones on a map – if the wearer wanders out of these, an alert is immediately sent to flag up that the wearer is in an unsafe zone. The Apple Watch Series 4 contains a gyroscope which can detect hard falls. An alarm sounds and the watch displays options to call emergency services or tap an ‘I’m okay’ button. If the watch detects movement, it waits for you to respond. However, if there’s no movement for about a minute, it calls the emergency services and alerts your emergency contacts of your fall, supplying your location. Lastly, it displays the wearer’s medical ID badge on screen for when the emergency medical response arrives. A lockable key safe – preferably police-approved ­– can enable the carer or relative to access the property in the case of an emergency. There are numerous locations systems which can track a loved one, from using the roaming signal on your mobile phone, to specific trackers such as the GPS SmartSole. This is a discrete programmed GPS sealed within in a shoe insole and allows relatives and carers to track their loved ones if they have wandered beyond prescribed safe limits around their home. For older people with specific issues such as dementia and Alzheimer’s, it can be even harder to help them remain safe and healthy in their own homes. There are an estimated 850,000 people with dementia in the UK and according to The Alzheimer’s Society website, one study suggests around 40% of people suffering from dementia get lost outside the home. Fortunately, tech can keep friends and relatives updated with useful information about those they care about, even if they live miles away. Activity monitoring system works via sensors positioned in various rooms and on doors, which alerts relatives if the older person doesn’t follow their daily routine. You can then call them yourself to see if they’re okay. There are also discrete plugs into which you can plug in regularly used appliances, such as a kettle, which send alerts to loved ones if the older person is deviating from their usual routine. Temperature alerts warn you when the temperature has risen or dropped from a pre-set range in your relative’s home. Locator systems on a smartphone app enable you to attach mini tiles to commonly lost items such as a purse. The tile can be tracked up to 150 feet with the item showing on a map. Similarly, key locators are small sensors you can attach to frequently used and easily mislaid items such as reading glasses, wallet and keys. When you mislay the item, the remote control with the transmitter can find it by setting off an alarm which leads to its location. Memory reminders – short-recorded messages, personalised by a relative – can be activated by a sensor on the front door to remind the person to take medication or pack their keys as they leave the house. More intelligent monitoring systems can warn relatives about risks in the home and include: smoke or heat sensors, carbon monoxide and natural gas detectors, flood detectors, bed or chair occupancy sensors and door-exit sensors, fall detectors, nocturnal epileptic seizure detectors, hypothermia alerts and incontinence alerts. Smart home technology, such as voice-operated hubs, can be controlled by a smart phone. Those with reduced mobility can open blinds, switch off lights or turn the radio on or off – without moving from their bed or chair. Additionally, operating these appliances by remote control removes the need to bend down to unplug or reaching to adjust thermostats so as to reduce the risk of falling. This is hugely beneficial, since one in three adults over 65 who live at home will have at least one fall per year and 50% of these will have more frequent falls. Significantly, falls are the most common cause of injury-related death in people over the age of 75 years, and admissions following injuries from falls massively contributes to the stress within the NHS and has a knock on effect for friends and relatives caring for the casualty too. Smart lighting can light the kitchen sufficiently when being used and turns the lights off afterwards. There are specific devices designed to reduce the risk of fires from cooking – ­one of the primary dangers for people who live alone. Smart sensors located under the cooker hood can become familiar with how the older person uses the cooker to avoid false alarms, however if the temperature rises and there is a fire hazard, it sets off the alarm. Automated beds can raise and lower themselves to make getting into or out of bed easier for older individuals and can be elevated for comfort. They also reduce the risk of falling and smart lighting can ensure the older person is not having to fumble around in the dark. Motion-activated toilet nightlights can illuminate the whole bathroom and remove the need for switching on the glaring overhead light, whilst avoiding messy mishaps in the dark. When washing, there are gadgets to remind you to turn off the taps when running a bath, and a device with a pressure plate which opens to allow excess water to drain out of the bath if it is overflowing. This also changes colour if the bath is too hot. Finally, it is clear there are so many incredibly helpful devices and new technological advancements emerging on a daily basis. The true challenge is discovering these inventions and establishing which ones would offer the greatest benefit for your older friends and relatives. Emma Hammett is the author of the Amazon Bestseller: Slips, Trips and Fractured Hips – the ultimate guide to accident prevention and first aid; helping us stay safe, health and active as we get older.